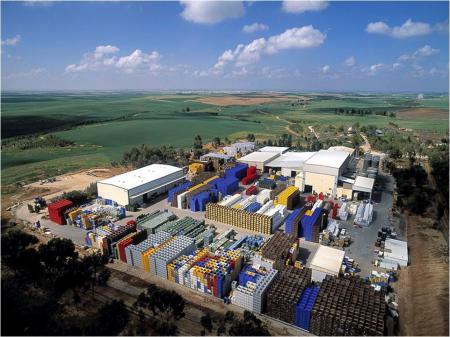 Plastic pallet box maker, Dolav is investing $25m in factory expansion due to complete in 2013 at its factory site southern Israel. From there, Dolav manufactures and distributes to 40 countries. The new build will doubled the size of the production facility to house more very large plastic injection moulding machines which are being made to order. A major investment in new tooling will further expand production capability for existing products and of next-generation containers. The new factory build and new plant will be complimented by new offices for the expanded Dolav customer service centre. Staff there continue to see strong demand in more than 40 countries for Dolav plastic products despite the economic downturn in some parts of the world. Commenting on the new developments, Dolav international marketing director, Nachum Shaham said, "Dolav is enjoying its best year ever (ends Dec 2012) and is substantially up on last year which was also a record year. Dolav products remain in high demand and one reason is because their very long service lives make them excellent value. That comes from the Dolav special processing of high strength polymers yielding abuse absorbent products." Shaham added that the important message for Dolav customers is that Dolav is investing in and ready for the future. Dolav has recently experienced the benefit of investment in new production equipment for its MV 1000 plastic pallet. The world's largest generic drug manufacturer, Teva, placed orders for 70,000 units for its new $100m middle-east distribution hub. Another customer in South America has just ordered and begun to receive its new order for 55,000 Dolav MV 1000 plastic pallets. Dolav pallets boxes have been sold in the UK and Ireland for more than thirty years. More than 600,000 have been supplied to the meat, agricultural, chemical, pharmaceutical, recycling, engineering and assembly industries. The Dolav Direct UK offices are in Watton, Norfolk where the general manager is Maria Plastow.